The Cottage at Wilson House in Barningham, near Richmond sleeps 4 people. The Cottage near Richmond is perfectly nestled in the rolling countryside, on a working farm, bordering North Yorkshire and County Durham; The Cottage at Wilson House offers guests peace, tranquillity and stunning views from every room. Attached to the owner’s home, yet retaining a level of privacy, guests will find the cottage welcoming, cosy and full of character. Perfect for walkers and cyclists, there are numerous established public footpaths and cycle paths that surround the local area and will lead guests through rolling countryside, open fields and unspoilt woodland. Perfect for an afternoon stroll, guests will find a CAMRA approved local pub only a mile away, as well as numerous others within an easy 15-minute radius. Perfect for exploring the magnificent Yorkshire Dales, The Cottage at Wilson House is close to Teesdale, Swaledale and Arkengarth Dale, which are becoming increasingly popular places for cyclists and walkers to explore and enjoy. Only 5 miles away from the historic market town of Barnard Castle, guests really must take a trip to the famous Bowes Museum as well as the old castle ruins. For guests wishing to travel a little further afield, there are excellent transport links along the A66 and the A1M. The cathedral city of Durham can be reached within an hour’s drive north, as well as the historic city of York in the opposite direction. The beautiful hills and fells of the Lake District are also only just over an hour’s drive west and to the east guests will find the fabulous beaches and coastline of Whitby and Saltburn by the Sea. 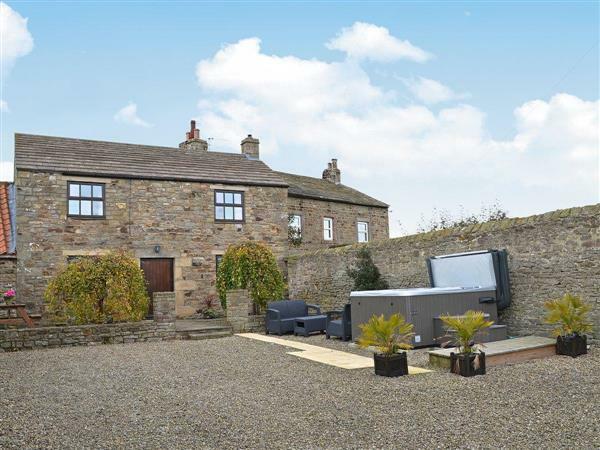 Perfect for couples wanting to enjoy a romantic break, there is a private courtyard and hot tub for guest’s use from which views of the surrounding countryside can be admired and enjoyed, as well as an outdoor seating area and Bar-be-que. The Cottage at Wilson House is charming and also perfect for friends wanting to share their holiday accommodation, with two double bedrooms on the ground floor, each with an en suite shower room. On the first floor, is an open plan kitchen/dining room and lounge area that really takes advantage of the surrounding views. Well equipped, welcoming and full of character, The Cottage at Wilson House really is the ideal destination at any time of year. The shop is 5 miles, with the pub and restaurant 1 mile from The Cottage near Richmond. Living area: With 28 Freeview TV. Kitchen area: With Rayburn, microwave, fridge, freezer, washing machine and tumble dryer. Oil central heating, electricity, bed linen, towels and Wi-Fi included. Welcome pack. Enclosed garden with sitting-out area, garden furniture and barbecue. Hot tub. Private parking for 3 cars. No smoking. Please note: No children under 12 years old. Holidays at The Cottage at Wilson House run from Friday to Friday. For a better idea of where The Cottage at Wilson House is, you can see The Cottage at Wilson House on the map below. The Cottage at Wilson House is in North Yorkshire; should you be on the lookout for a special offer, you can find all the special offers in North Yorkshire. It's always worth checking to see what is on offer at the moment. Do you want to holiday near The Cottage at Wilson House (UKC575), you can see other cottages within 25 miles of The Cottage at Wilson House; have a look to find your perfect holiday location.